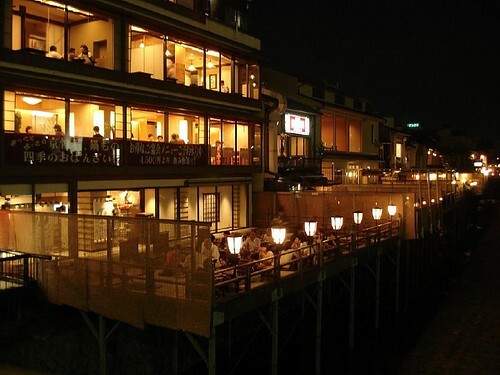 Midori is always packed to the brim, originally uploaded by Camemberu. 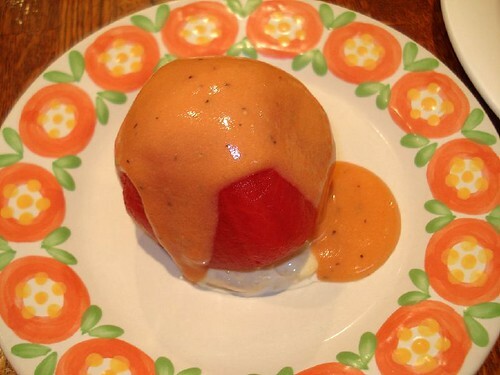 This is the last entry for the Japan food trail. Midori Sushi has gained a reputation for excellent value-for-money sushi, and it would have been a waste not to try it. We checked out the Shibuya branch at Mark City. There is a perpetual queue outside and we even detected Singaporean accents further down the line. Fortunately we didn't have to wait long. And the minute you walk into the shop, you are greeted by the fresh scent of seafood that just makes you smile in anticipation. 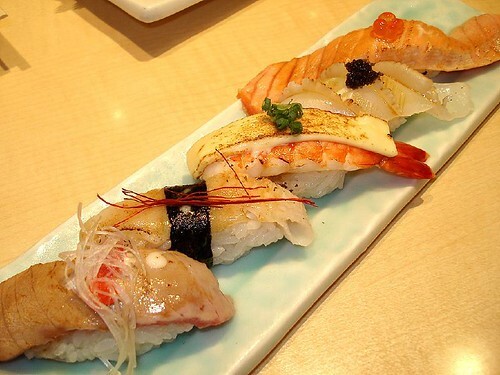 The aburi platter - toro, some white fish, shrimp, squid and salmon, originally uploaded by Camemberu. 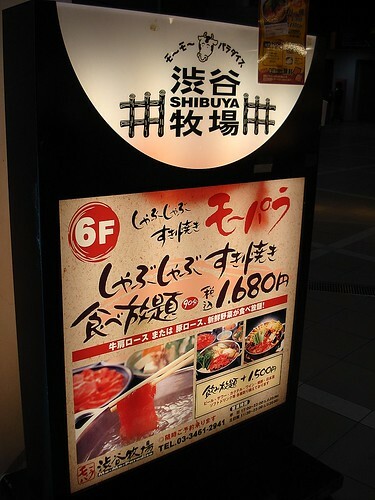 The first thing I ordered was the five-piece aburi platter (only ¥819). I love the effects of the blowtorch on sushi, toasting and searing in fatty goodness on top but leaving the bottom half raw. 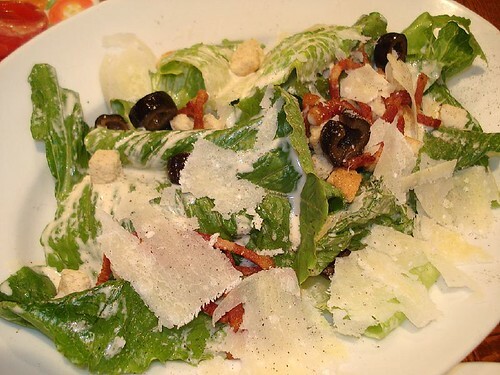 This lends a multi-dimensional sensation for the tastebuds. 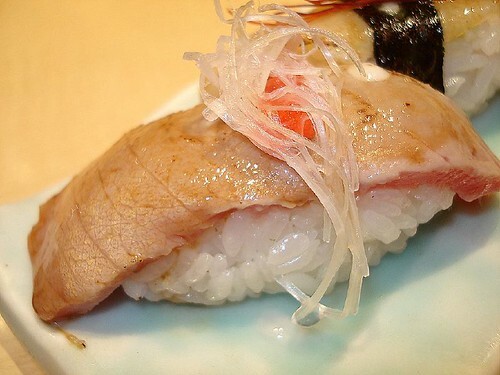 The aburi toro - seared on top; still raw at the bottom, originally uploaded by Camemberu. 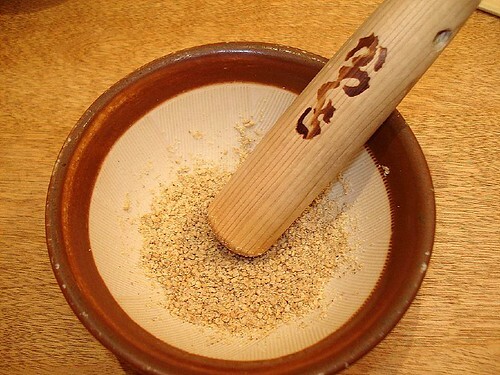 Here, I have to show you how nicely the toro is done. Yums. 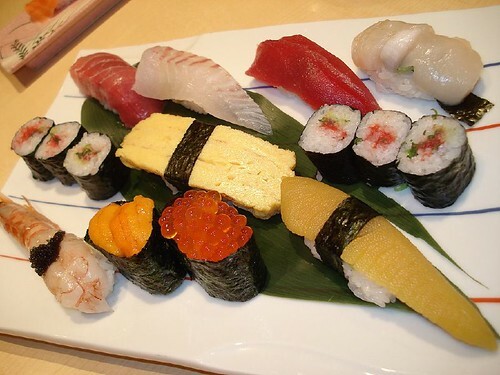 One of the many sushi sets, originally uploaded by Camemberu. 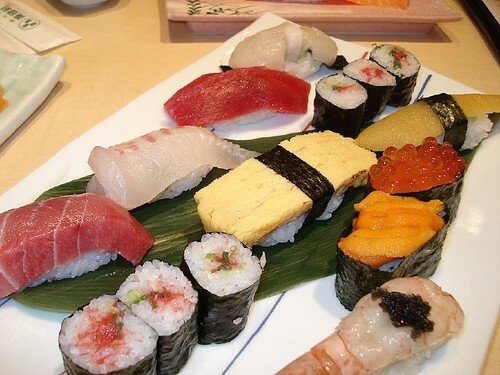 There are many sushi sets to choose from (see their online menu). I went for the ¥1,680 set which arrived beautifully presented and with the seafood in chunky portions. Another look at the sushi set, originally uploaded by Camemberu. 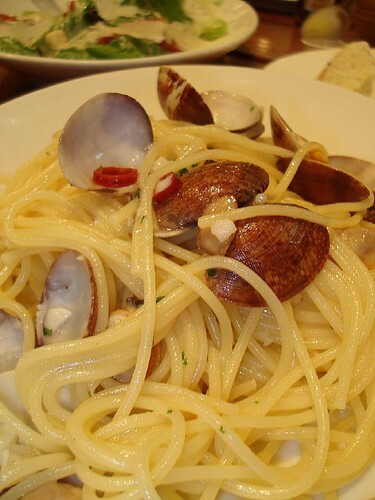 Everything was reasonably fresh and delicious. The only taste I still haven't acquired is for uni, so I can't really tell whether it was good or not. 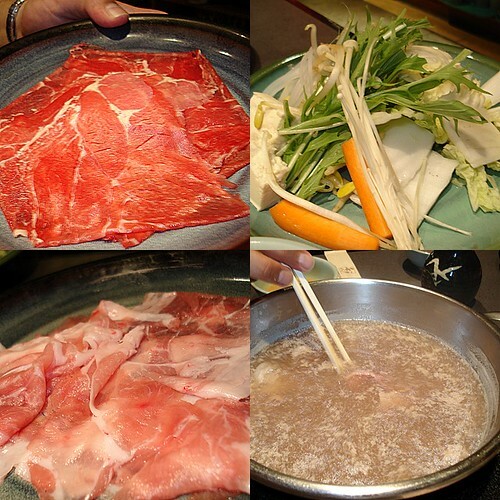 The chutoro also was a bit sinewy but other than that, everything was fat and juicy. 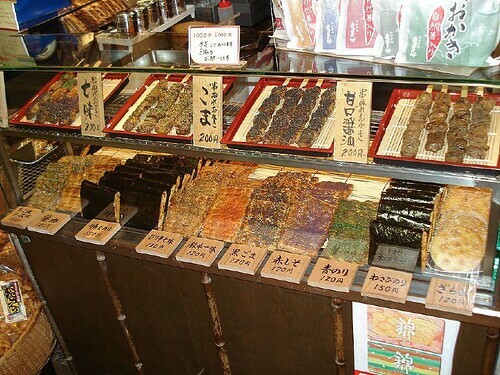 Just look at the beautiful slab of kazunoko (herring roe, bottom right piece). 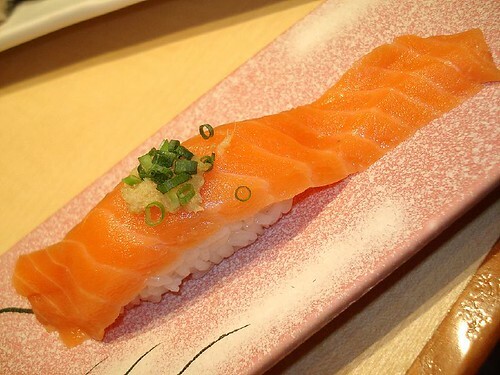 Salmon nigiri, originally uploaded by Camemberu. There is so much more salmon than rice that you have enough to wrap the fish all around the rice if you wanted. They also do really good rolls. We went for an order of the California maki (since hubby doesn't take much raw stuff). Huge pieces with generous tobiko and avocado (some areas browning but it didn't affect the taste). 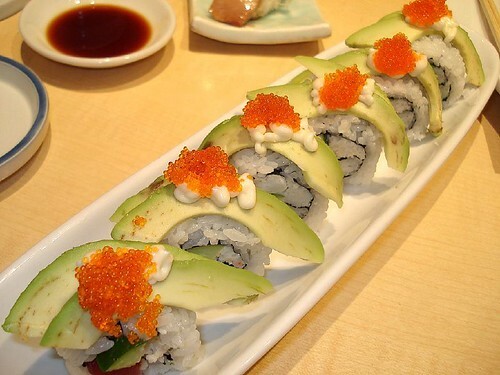 California maki close-up, originally uploaded by Camemberu. This is the first time I've seen a rendition with a slab of raw tuna embedded though - it's sticking out like a cheeky tongue! 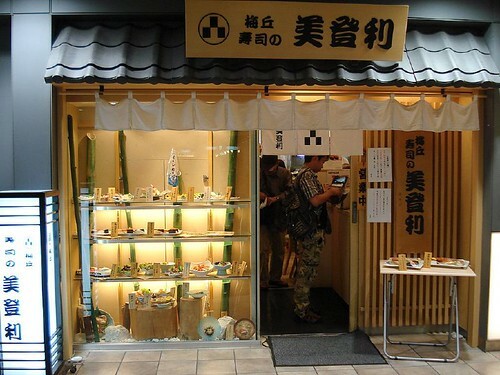 Midori Shibuya shopfront at Mark City, originally uploaded by Camemberu. So there you have it. 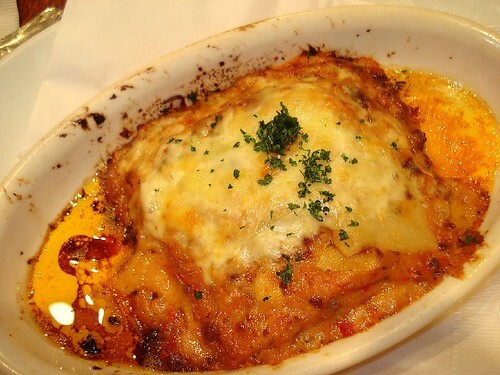 A most filling and fulfilling meal! 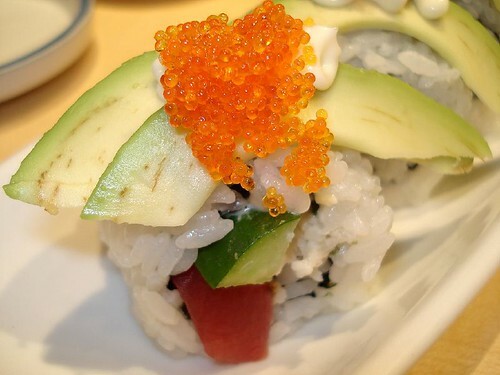 Is it the best and most exquisite sushi you will ever have? 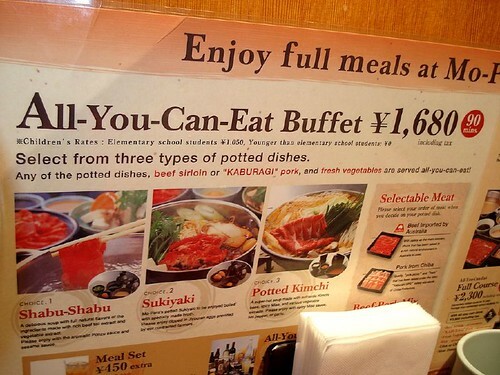 Perhaps not, but it's certainly cheap and good. Check out other raves and photos about Midori at: Merry Man in Japan, Pig Out Diary, and Andrea Harner. 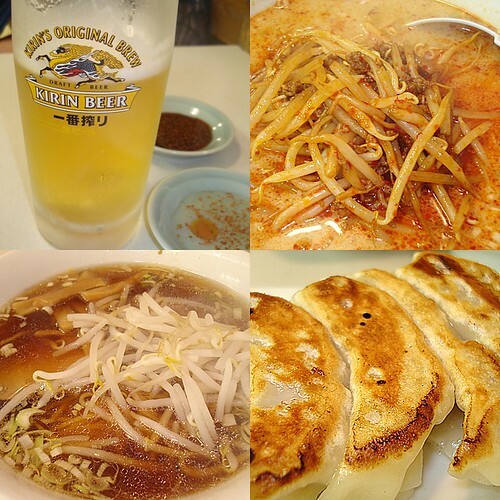 Clockwise from top left: Beer, tan-tan ramen, gyoza, chuka ramen, originally uploaded by Camemberu. Back in Tokyo for just a day before we head home. We didn't really have lunch on the shinkansen - just some bites we packed from the very nice Kobeya Bakery from Shin-Osaka. 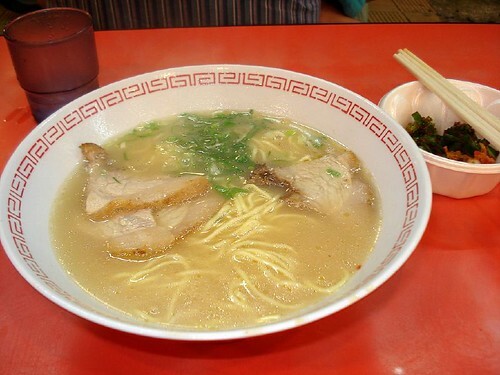 So in the late afternoon, we randomly hit up this Chinese ramen joint at the fork of a road in Shibuya en route to the Ishibashi music store. 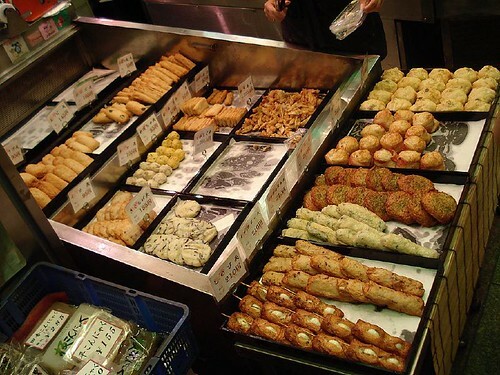 Fantastic gyoza at only ¥200 or ¥280 (can't remember! ), for six pieces. 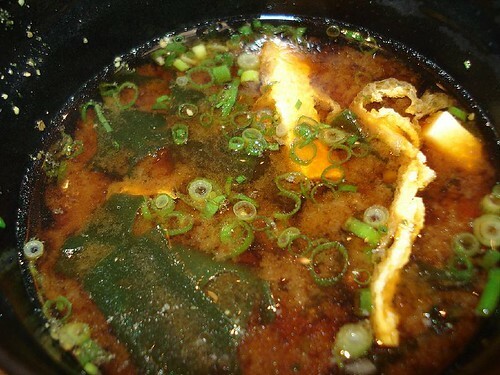 Hubby enjoyed his soy sauce ramen but I didn't think much of my volcanic broth of tan-tan ramen. All washed down with beer. 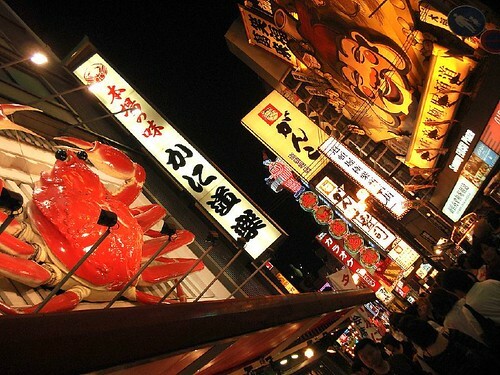 Dazzling Dotonbori-the food street that goes on and on!, originally uploaded by Camemberu. Osaka turned out to be the surprise highlight of the trip. The city pulses with young energy, and is sleek, bold, chic and hip. Everything was larger than life - from towering neon ads to the huge mechatronic signboard gizmos. 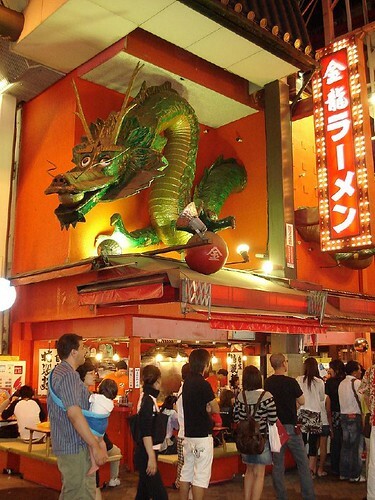 No wonder sci-fi writer William Gibson said that if you want to look for the modern and futuristic, you'll find it more in cities like Osaka and Kobe more than Tokyo. 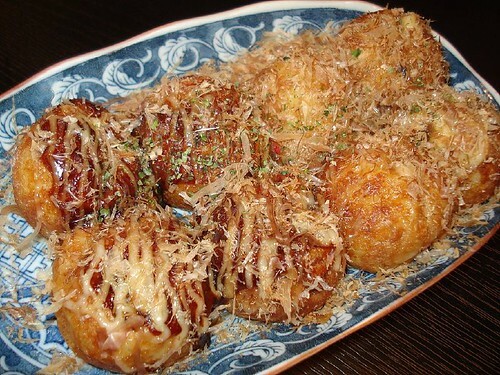 Takoyaki - symbol of Osaka cuisine, originally uploaded by Camemberu. 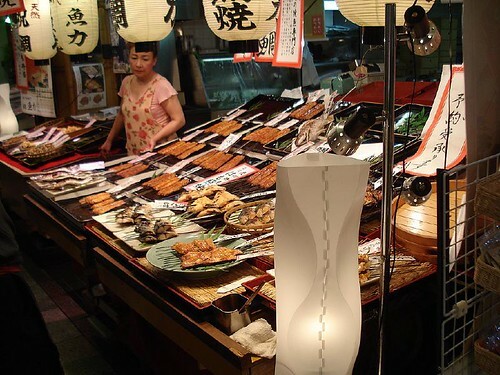 Osaka is also known as the food capital of Japan. 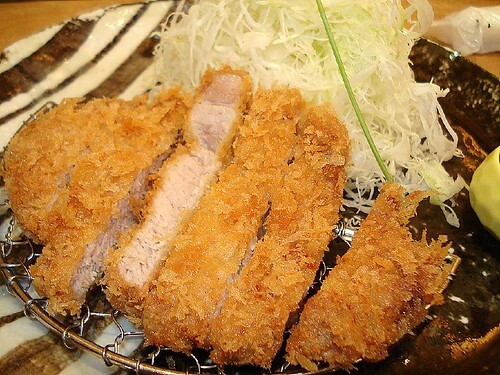 However, I find its cuisine not as varied or interesting as what you can find in Tokyo. 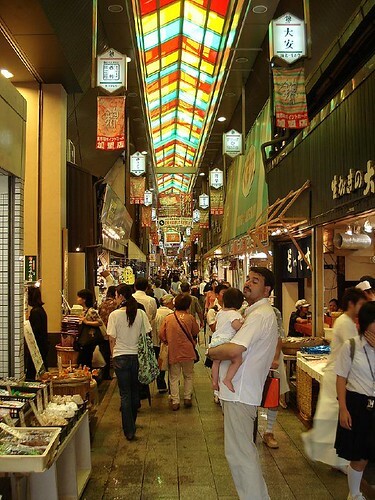 But I'm sure I have not explored enough of Osaka yet. 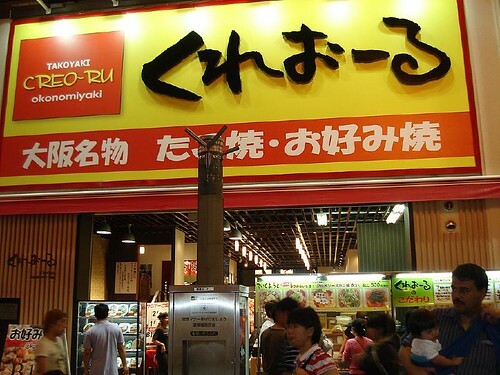 Anyway, one of the most famous icons of Osaka is the takoyaki (grilled octopus flour balls). 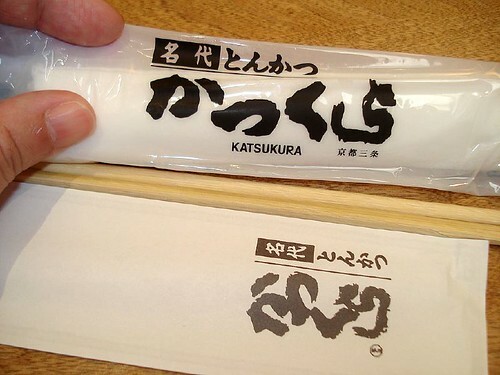 We tried two kinds - one with sauce, and one without (see above). Tasty snacks indeed. 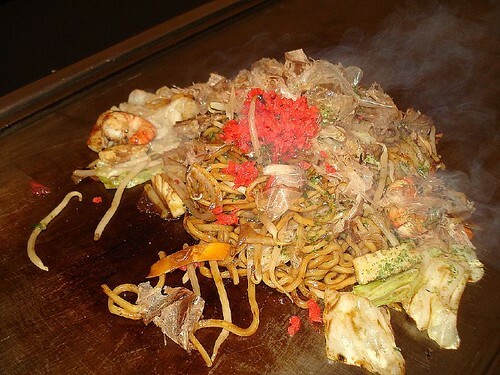 Yakisoba sizzling at your personal table griddle, originally uploaded by Camemberu. Takoyaki alone wasn't going to be enough for dinner. Since we already tried Osaka-style okonomiyaki in Kyoto, we opted for a mixed yakisoba (with pork, shrimp and squid). 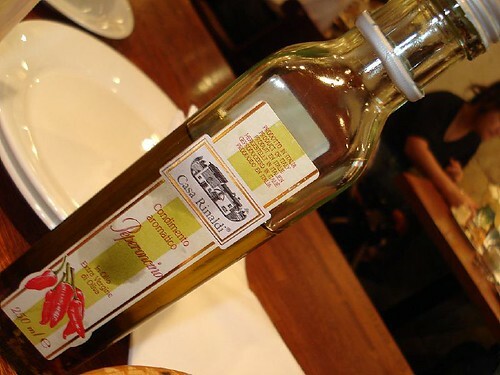 They bring the sizzling dish and let it finish cooking on the hot griddle at your table, so you can have some fun charring it to your heart's content. Creo-ru, what an unusual name!, originally uploaded by Camemberu. We ate at Creo-ru (don't ask me what it means! 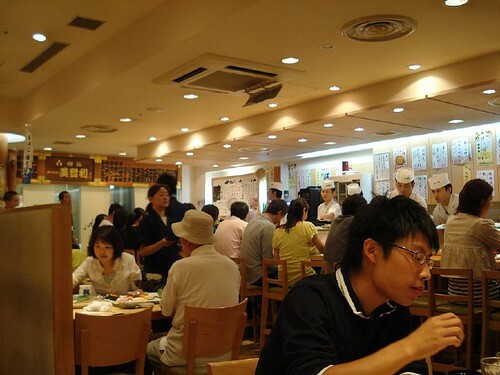 ), which has both a takeaway takoyaki frontage and sit-down places to enjoy okonomiyaki and other dishes. Rei-Chan Okonomiyaki at JR Hiroshima station, originally uploaded by Camemberu. 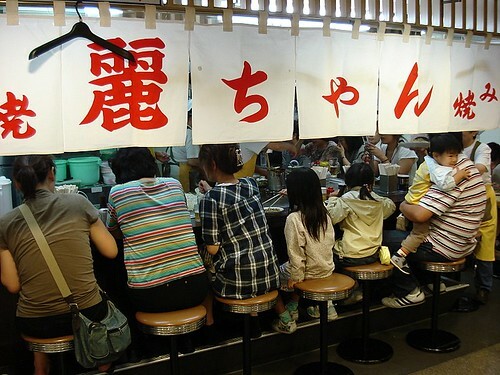 Practically every travel guide tells you okonomiyaki is a must-try when in Hiroshima. Such joints are legion in the city, you'll have no issue finding one. Only trouble is - which one! As we didn't have that much time, we settled for something within the JR station (which is pretty huge itself). 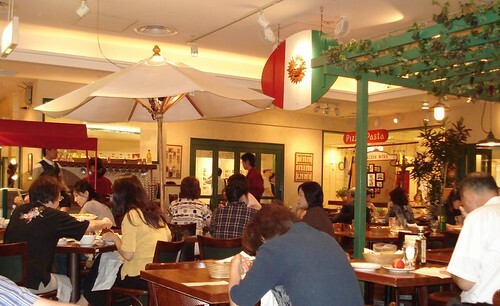 Near the delightfully named Asse Shopping Mall on the second floor, we found a row of restaurants. Rei-chan Okonomiyaki looked the most popular - so much so that they had two branches, and both were fully packed with customers! Busy but friendly cooks whip up your order right in front of you, originally uploaded by Camemberu. 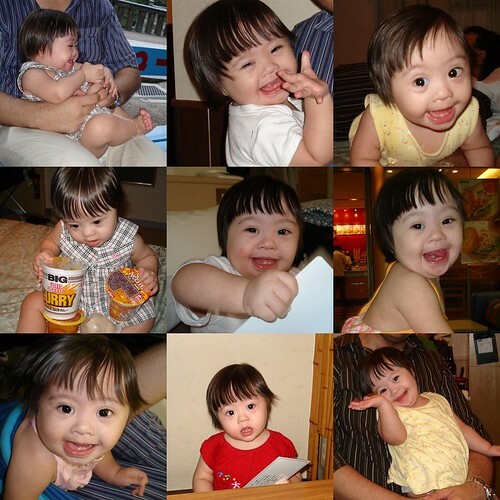 Rei-chan has a lively atmosphere in all aspects of sight, smell and sound. It's fun watching the skilled and energetic ladies working the griddle while entertaining guests. 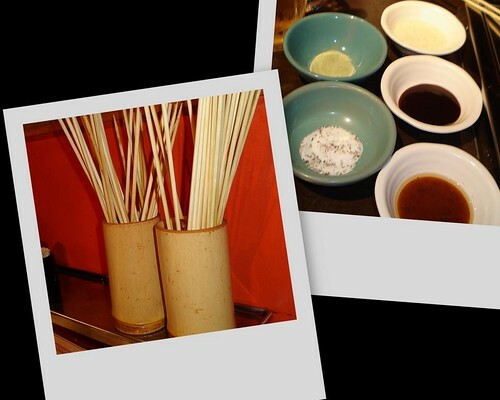 The din of cooking adds to the irresistible aromas that pin you to the site. It's also a highly efficient place. They take your order even as you queue, and food arrives almost as soon as you are seated. 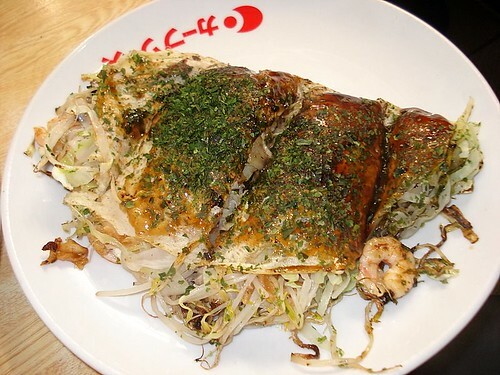 Hiroshima-style okonomiyaki, originally uploaded by Camemberu. So here it is. Hmm, I hadn't expected a foldover of a pancake but I guess it's so huge, it wouldn't fit on the plate unfolded. 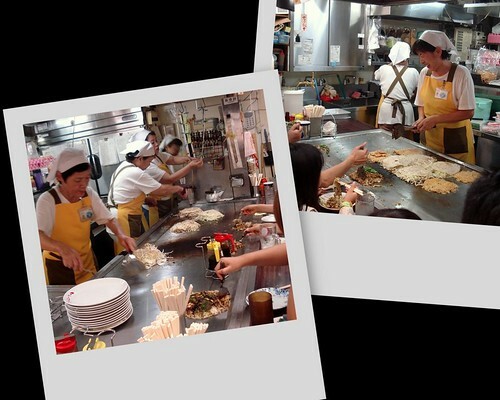 Hiroshima's style of okonomiyaki involves more layering of ingredients whereas Osaka's jumbles everything together. These two cities are fiercely loyal to their version, and God forbid you tell a citizen from one city that you prefer the other city's style! 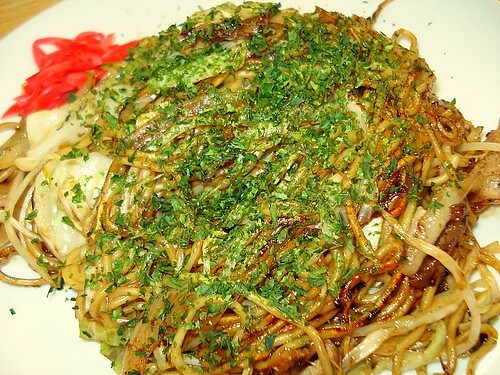 Yakisoba, originally uploaded by Camemberu. We also had a yakisoba (fried buckwheat noodles) which came with an overwhelmingly generous sprinkling of aonori (green seaweed bits). Tastewise, as with the okonomiyaki, was so-so. Perhaps we didn't order the right variant (many types of ingredients available). Something smelt really good cooking in that shop but whatever it is, it didn't land on our plates. But I have to say the friendly ladies there were simply wonderful. 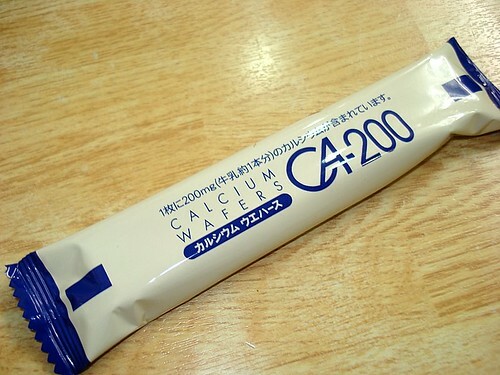 They gave us a little calcium wafer bar for Nadine since she was too young to partake in the fried foods. So kind and thoughtful of them! I'll say it again, the Japanese really love children! 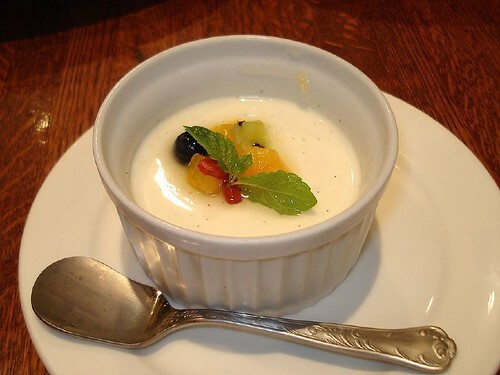 Five-berry tart, originally uploaded by Camemberu. We were quite amused to see Lipton cafes in Kyoto. But the dessert showcase they featured was no laughing matter. Everything looked fabulous! After the Katsukura lunch, we adjourned here (just next door!) for a sweet bite or two. 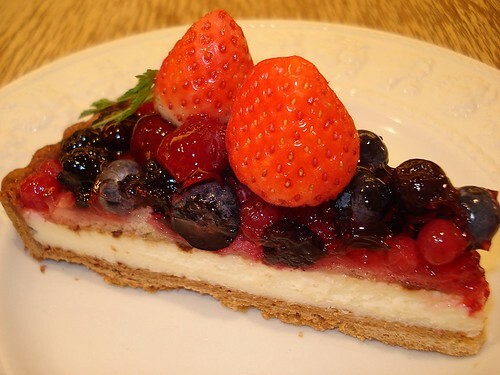 The five-berry tart laden with luscious fruit tasted as good as it looked. Not achingly sweet, thankfully. Strawberry shortcake, originally uploaded by Camemberu. 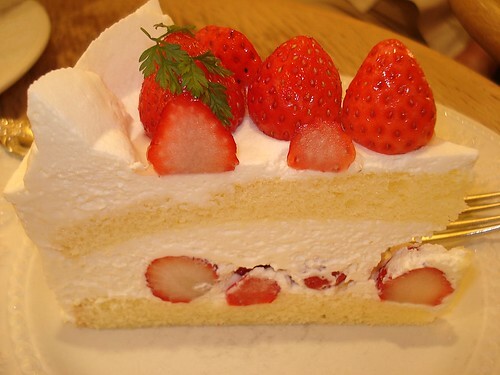 The strawberry shortcake was very delicate and tasted much more refined than the versions in Singapore. My only grouse about the desserts here are that they are served too tiny a sliver. Gimme more! 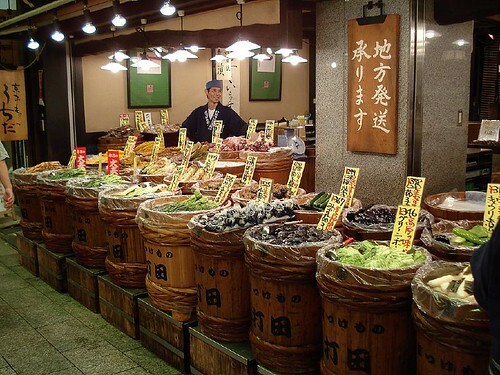 Nishiki Market in Kyoto, originally uploaded by Camemberu. 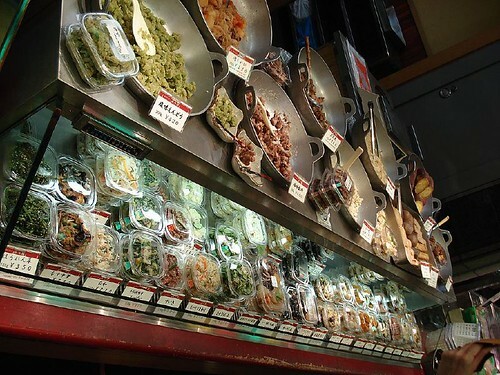 Dubbed the "Kitchen of Kyoto", Nishiki market carries all kinds of fresh and processed foods in a narrow shopping alley just one block north of the busy Shijo-dori thoroughfare. 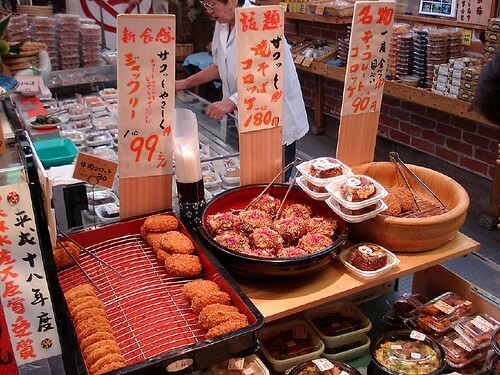 It stretches nearly 400m to Teramachi and showcases over 100 shops selling fish, seafood, vegetables, fruits, pickles, tofu products, wagashi (Japanese sweets), dried goods, snacks and ready-to-eat food. I'll let the rest of the photos speak for themselves. 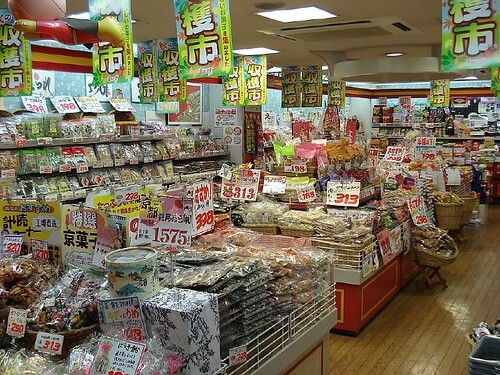 Senbei galore! Roasted rice crackers of various flavours, originally uploaded by Camemberu. 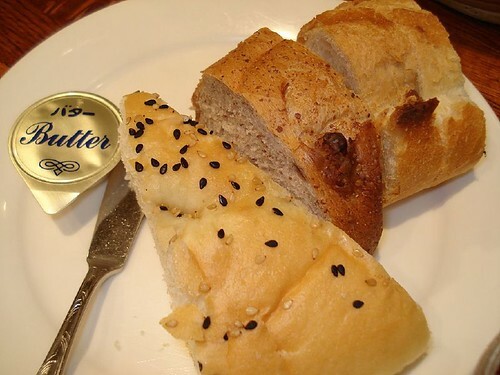 Appetisers of all kinds, originally uploaded by Camemberu. 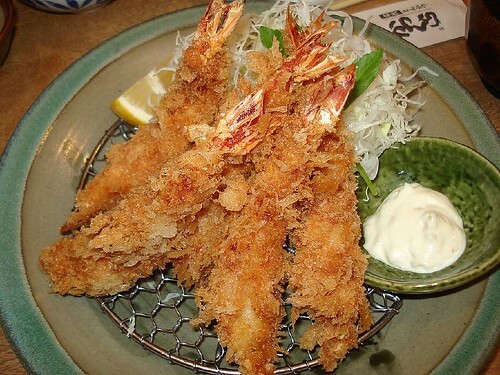 Fried croquettes, ready to eat, originally uploaded by Camemberu. 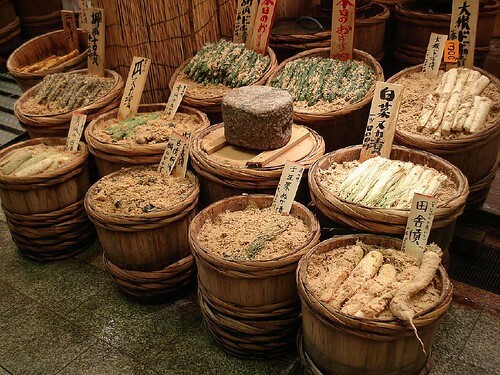 Vegetables - pickled, I think, originally uploaded by Camemberu. Snacks and junk food up the wazoo!, originally uploaded by Camemberu. 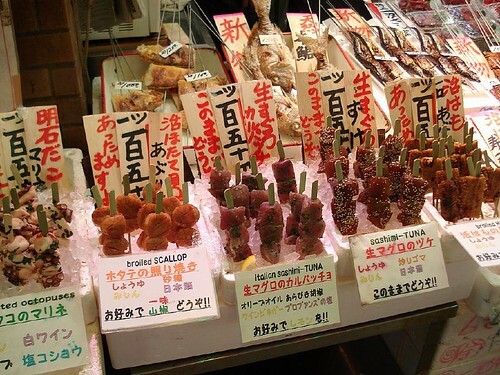 Erm, sashimi lollies? 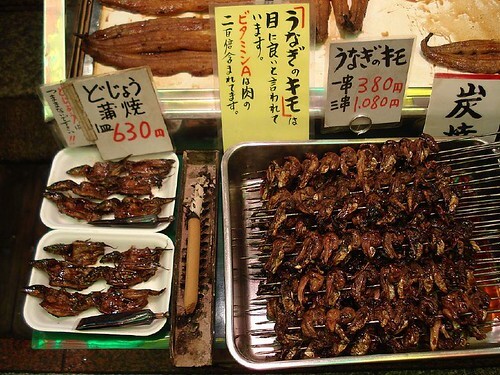 Not sure if these are meant for the BBQ or ready-to-eat, originally uploaded by Camemberu. All kinds of greasy fried fishcake/tofu products, originally uploaded by Camemberu. 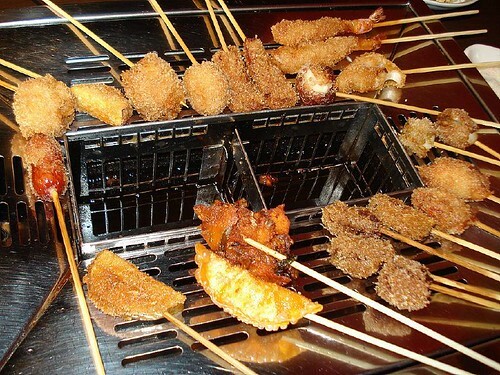 Grilled skewers of seafood, originally uploaded by Camemberu. 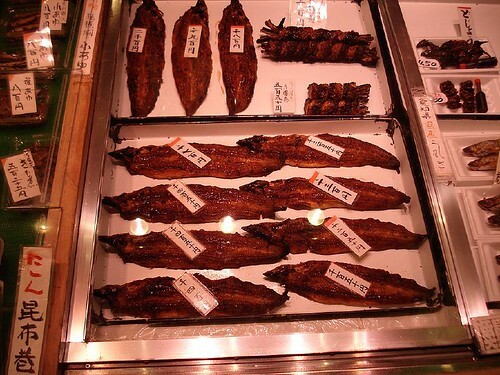 Unagi kabayaki - grilled sea eels, originally uploaded by Camemberu. 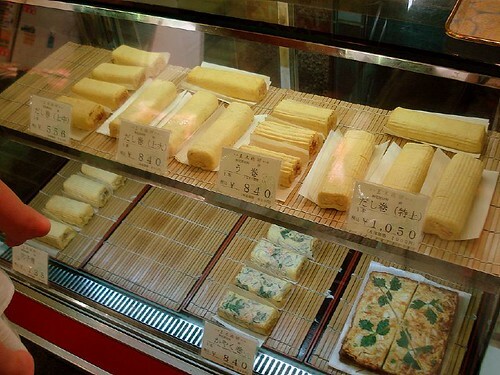 Grilled omelette rolls?, originally uploaded by Camemberu. 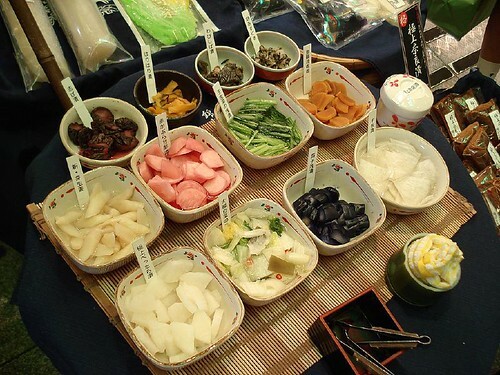 Miso-marinated vegetables?, originally uploaded by Camemberu. Colourful pickles for sampling, originally uploaded by Camemberu. OK, I don't know what these are, and I don't think I wanna know! Could be those infamous BBQ'd sparrows!, originally uploaded by Camemberu.